Couldn’t sleep the other night — and feeling a little under the weather — so figured I’d have myself a cuppa lemon-ginger tea. and honey never spoils either). This honey was made by bees who spent their days busy at the High Line. Figured that would make the it all the more healing because we all share the same bugs (and uh-hum bees) in this neighborhood. 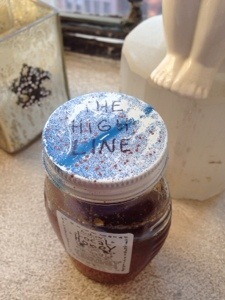 Simply bzzzzing with health after that cuppa infused with the essence of the High Line.